Marshall McPeek, meteorologist for WSYX-TV/WTTE-TV in Columbus, OH and Sean Lewis, anchor at WGN-TV in Chicago, in tweet photo posted by Mary Emily O’Hara. 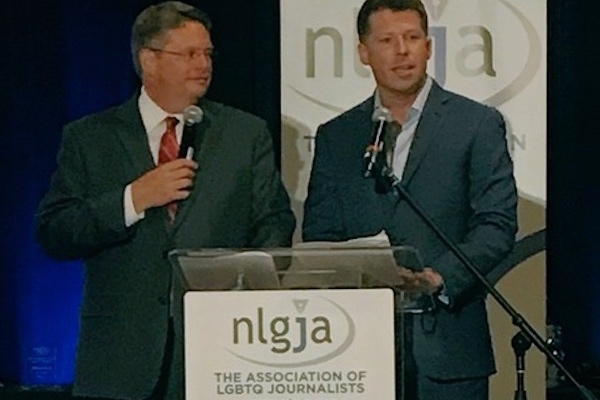 Openly gay Columbus, Ohio meteorologist Marshall McPeek, a longtime member of NLGJA: The Association of LGBTQ Journalists, apparently skipped all the references to the importance of respecting transgender people in the NLGJA Stylebook and its recent supplement on terminology. 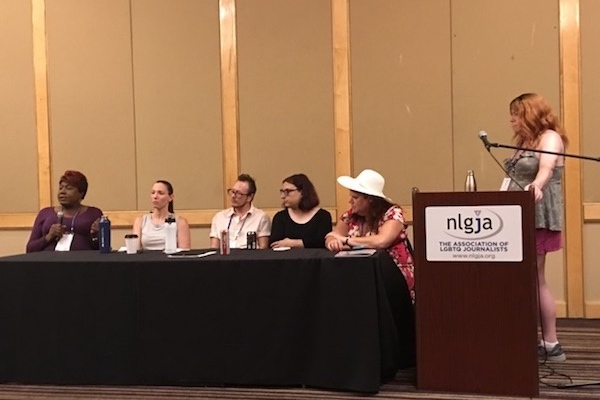 In a crassly symbolic display of the murky chasm between a mission statement and practice, McPeek opened his remarks at NGLJA’s closing reception Sept. 8 in Palm Springs with “Ladies and gentlemen, things and its” in welcoming the audience. 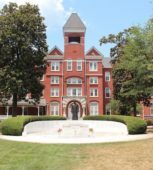 Black TransGriot blogger Monica Roberts yelled at the stage: “Oh no, he did not….There are no Things or Its here!” And though an immediate tweet by them reporter Mary Emily O’Hara on McPeek’s comment went viral. McPeek subsequently apologized, as did NLGJA. “People were understandably hurt and offended by last night’s remarks. As journalists, we understand uniquely that words matter. We apologize and are committed to working to make NLGJA more inclusive and diverse,” NLGJA’s statement read. 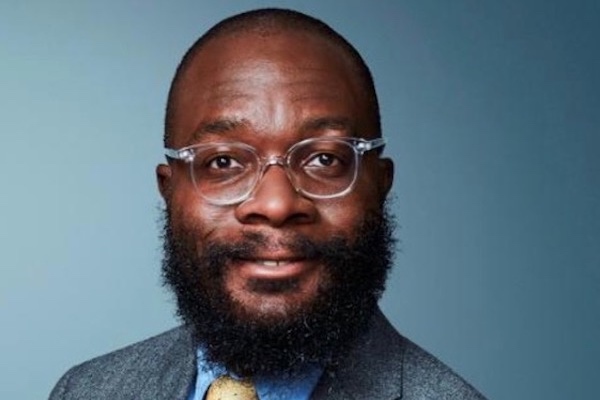 “When I heard about the comment, I was mortified,” incoming NLGJA’s first African American President Sharif Durhams (Senior Editor, CNN Digital) said in a statement to the Los Angeles Blade. “People have used slurs about my race and sexual orientation. There are comments that are painful and that you can’t take back. We’re supposed to provide a space that’s safe. “We have and have had transgender and non-binary members on our board of directors, and we listen to them. Transgender and non-binary members pitch panels, and we ask them to lead those panels. Transgender and non-binary members weigh in when we change our stylebook and when we work with media organizations on fixing problematic coverage. We’re going to continue to do all of that,” he continued. Durhams also responded to questions about NLGJA receiving funding from Fox News. “Members of NLGJA and other LGBTQ journalists work there, and their employer is supporting them. 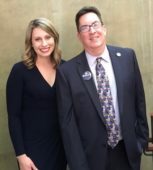 We want to promote fair, accurate coverage of our community by all news organizations, so we’re working with as many as we can,” he said. 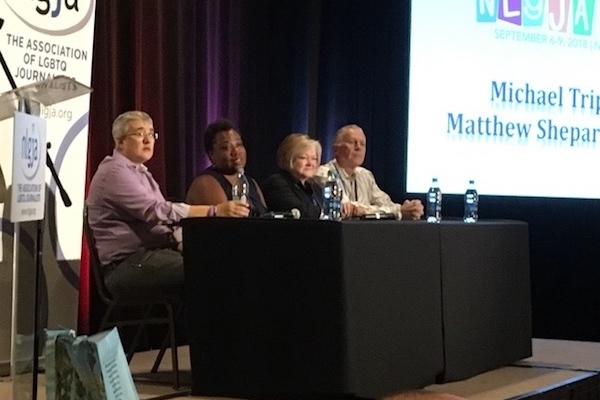 Also saddened by McPeek’s comments were many of the other participants at the NLGJA convention, as well as attendees at the 10th annual national convening of LGBT editors and bloggers put on by the Evelyn and Walter Haas Jr. Fund and the Arcus Foundation. 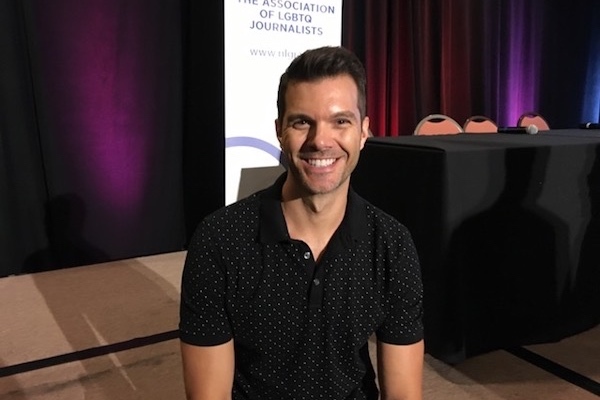 This year #LGBTMedia2018 was organized in conjunction with NLGJA, coordinated by NLGJA Executive Director Adam Pawlus. 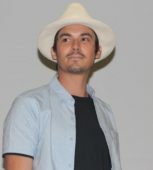 “We’re waiting for feedback from the convening’s attendees about the new format before deciding what to do next year,” Haas Jr. Senior Program Director Matt Foreman told the LA Blade. Unfortunately, McPeek’s offensive transphobic comment overshadowed what was otherwise a very interesting and productive four days of networking, education and professional development—and totally obscured the incredible contributions by a number of trans presenters. Convening MC Bethany Grace Howe, for instance, is a writer at HuffPo, and doctoral student at the University of Oregon where she is gathering facts and statistics about trans identity and the development of defense-related emotions. She also has a casual side-splitting sense of humor that disrupted the furrowed-brow thinking as we followed presenters such as digital archivist Matt Dellinger, who provided resources for archival storytelling and Brian Malte, executive director of Hope and Heal Fund, as he talked about working with the Williams Institute to research the relationship of gun violence to the LGBT community beyond the shooting at Pulse nightclub, a research report expected out next November. There were also a number of personal development and intense off-the-record exchanges. 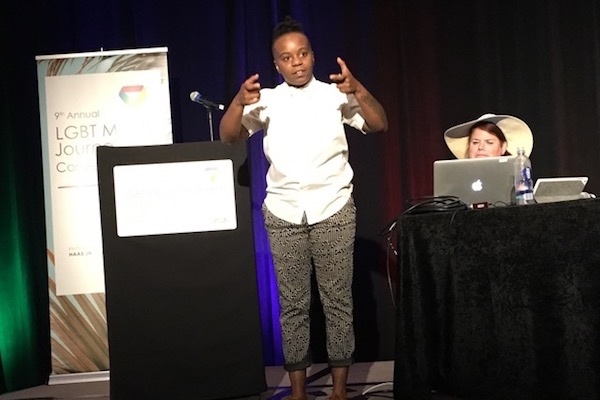 Kei Williams, a queer transmasculine identified designer, writer, public speaker, organizer and founding member of Black Lives Matter Global Network in New York, led convening attendees in a series of “get-to-know-you” questions that broke down personal barriers some folks didn’t know were up: “Who are your people?” There was an off-the-record exchange with former Equality California Jim Carroll about his candid reflections on the battle over Prop 8, still a sore subject to many, and an on-the-record discussion with Evan Wolfson, former founder of the successful Freedom to Marry campaign who is now advising organizations on winning movement strategies and reminded everyone that marriage equality wasn’t a gift from the Supreme Court but was a hard-won victory changing hearts, minds and laws. 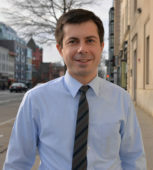 Wolfson also said that while the times may be dark, he operates from a place of hope, recognizing that the LGBT community has made substantial progress and should fight building on success, no matter the brief setbacks. And there was a lively discussion about how to cover LGBT issues in red states, with Think Progress’ Zack Ford (celebrating his birthday!) and Buzzfeed’s Dominic Holden in hearty dispute with the panelists’ conclusions. 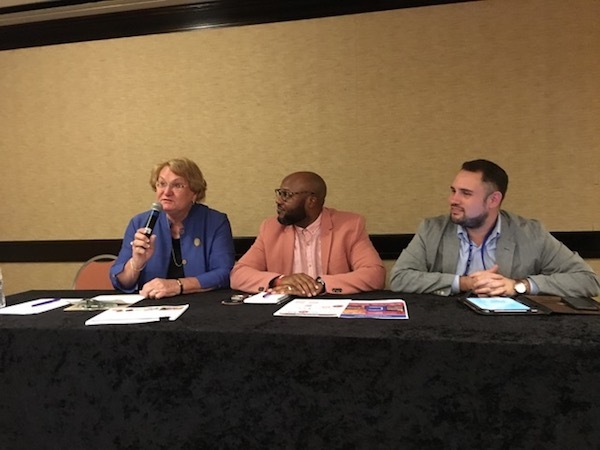 And with the new format, LGBT media conveners got to attend NLGJA panels — such as Google fundamental tools for journalists, “Dead Names” and Real Lives in Obituaries, HIV & AIDS stories with HIV Plus Magazine’s Diane and Jacob Anderson-Minshall, and Gay and Graying, moderated by Palm Springs trans City Councilmember Lisa Middleton with AARP’s senior advisor and LGBT liaison Nil-Quartelai Quartey (who asked: “what keeps you up at night?”) and Jason Rosendez, Director of USAgainstAlzheimer’s Latino Network, who described alzheimer’s disease as “the second inconvenient truth.” There are an estimated 1 million LGBT seniors, a number expected to double by 2030— “the first out generation to grow old,” said Middleton; another estimate projects adults over 65 will outnumber children under 18 by 2035. One of the most moving panels was entitled very simply “Trans 101” with Ina Fried, Brooke Sopelsa, Jacob Anderson-Minshall, Bethany Grace Howe, with Monica Roberts asked to join from the audience, and MCed by Dawn Ennis. But it was anything but simple. 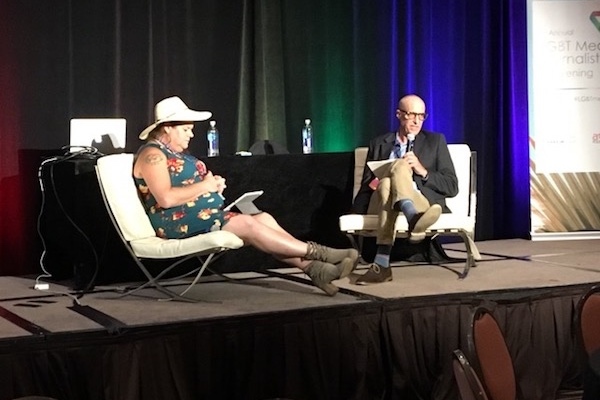 Axios’ Ina Fried, a longtime member of NLGJA, remembered Los Angeles Times transgender sports columnist Mike Penner who publicly transitioned into Christine Daniels, with the help of friends like Ina and support from LA’s MCC Church. 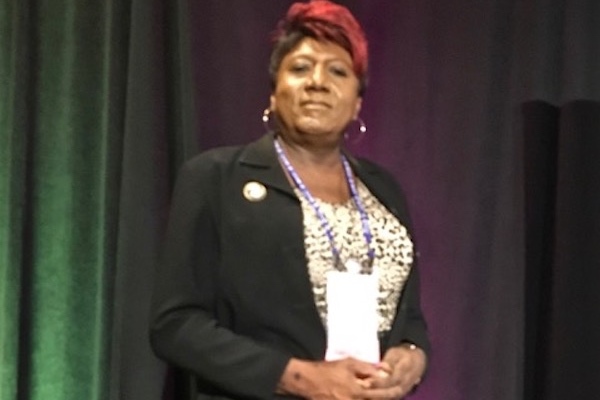 Christine was heralded and spoke at NLGJA’s 2007 convention, but was inwardly tormented, “de-transitioned,” and committed suicide Nov. 29, 2009. The LA Times, which had supported her transition, struggled to explain what happened. Ina and others who remembered Christine – and Mike – were still sad on the late afternoon of Sept. 8, 2018. NLGJA also held plenaries, the most stirring of which was the Michael Triplett Series: Matthew Shepard 20 Years Later with Dennis and Judy Shepard of the Matthew Shepard Foundation, Beverly Tillery, executive director of New York’s Anti-Violence Project, with longtime communications expert Cathy Renna serving as host. It was 20 years ago that University of Wyoming student Matthew Shepard was lured out of a local bar by two men, beaten, tortured and left to die hanging on a remote fence near Laramie, Wyoming on the night of Oct. 6, 1998. He died six days later of head injuries. His death became a media firestorm as reporters focused on what role his being gay played in his murder. After reading news coverage, Renna left her New York office at GLAAD and flew to Wyoming to help Dennis and Judy Shepard deal with the massive media descending on them as the perpetrators went to trial. Matt would have been 42 this December. “If you’re under 45, you’re one of ours,” Dennis noted. “If we can’t take care of him, we can take care of the rest of our kids.” Judy said she is “angrier now than when she first started doing this work,” with hate crimes rising in this new political climate. Mitchell Gold asked about the role anti-LGBT religious bigotry plays. “Religion is really our biggest roadblock to acceptance and equality for the LGBT community,” Judy Shepard said. “If it changed, it would change everything.” But the solution right now, she said, is to vote in the midterms. 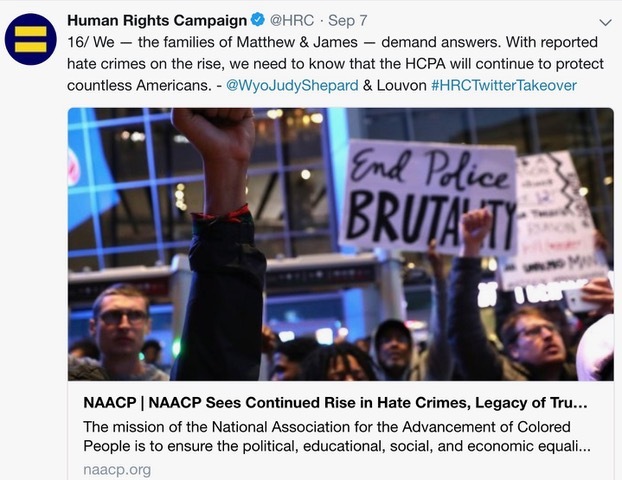 Judy also noted that she and Louvon Byrd “took over” the Human Rights campaign twitter feed on Sept. 7 to talk about the need to report hate crimes. James Byrd Jr was murdered by three white supremacists on June 7, 1998, dragged behind a pickup truck on an asphalt road for three miles until his body fell apart. The Shepards and the Byrd family worked together to get the federal hate crimes law passed. 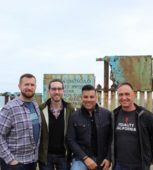 Other NLGJA plenaries included “That’s So Hollywood,” moderated by Steve Holzer with West Hollywood-based author and TV host A.J. Gibson, Dr. Jon Paul Higgins, and Chris Azzopardi who made Jane Fonda cry when he asked her why gays love women of a certain age and a plenary featuring Monica Roberts, Donna Rossi, Karl Schmid, and David Begnaud, who talked about his reporting on the devastation of Hurricane Maria in Puerto Rico—he is reporting on Hurricane Florence right now. The other benefit of the NLGJA and #LGBTMedia2018 convening was the personal networking. 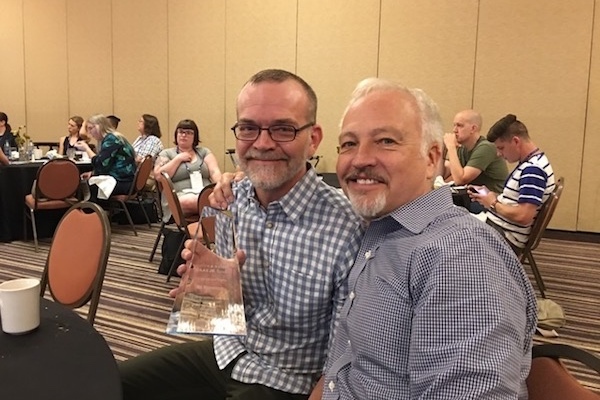 Bilerico Project founder Bil Browning, now with LGBTQ Nation, was given a “thank you” award by Matt Foreman for organizing the LGBT Media Convenings for many years. 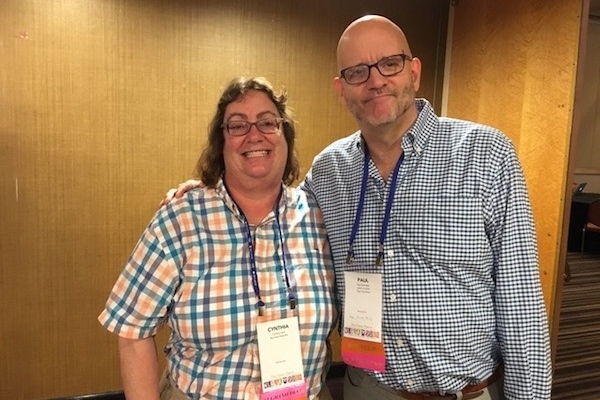 And I was surprised to learn that Cynthia Laird, editor of the Bay Area Reporter and Paul Schindler, editor of Gay City News in New York had never met, though each has toiled in the land of LGBT journalism for decades. 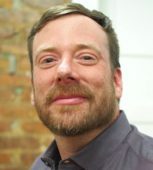 Schindler said he and Duncan Osborne have launched the laborious task of digitizing and preparing old news clippings and remembrances in advance of the 50th anniversary of the Stonewall riots, anticipating that mainstream media will probably rely on facile information minus the nuances of the LGBT sensibility. 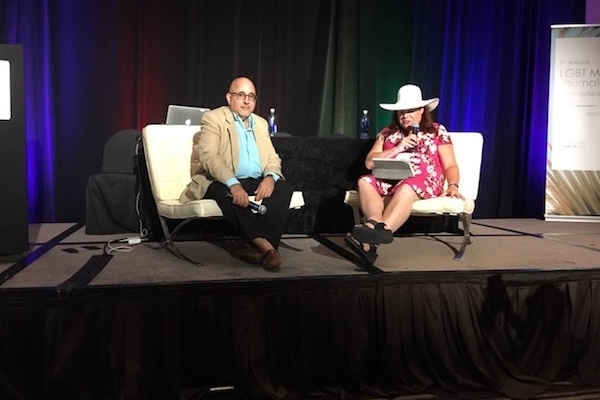 This is only some of what occurred during the Haas LGBT Media Convening and the NLGJA convention – overshadowed by the casual, offensive transphobic remark made by Marshall McPeek. But for those in the rooms where it happened, new friendships, new insights and new data will surely inform reporting on LGBT issues going forward.